Urban and low-rainfall areas are tough on trees, and many are too large for urban sites. But voila! Outdoor artificial trees solve those problems. And more - with silk foliage you can tastefully tuck a faux arrangement into a corner or any other spot where it will look great, maximizing its aesthetic value. Top quality options in 4- to 8-foot heights provide the human scale you need for many outdoor settings, whether a welcoming doorway, seating accent, or natural element to blend with any property features. We offer exterior silk trees including red and green Japanese and other maples, oaks and ficus. Happily, our products meet the highest UV standards. UV resistant chemicals are impregnated into the fabric, plastic and PVC materials, utilizing ASTM G-1550-5 tests to see how well they stand up to sunlight, moisture, and heat. When tested, these units showed NO visible color loss after a full year. See our planters by shape pages to find the ideal standard or custom planter box to complete your outdoor décor. Green, lush accents blend with any building and virtually every color scheme and combine easily to dramatize flowers, plants or other "statement" element you select. We also offer red choices in our silk selection. And no matter what your choice, both the leaves and bark will look amazingly authentic. A lively, natural environment encourages relaxation and creativity, making artificial trees a top choice for any location where live trees may not flourish or you don't want to spend time caring for and trimming them. A faux choice also ensures that the height you select will remain constant, avoiding the unpredictable growth. Lastly, choose the perfect planter for your investment. See our shapes gallery for great ideas. Our weighted bases work perfectly with our planters to keep inserts in place. We are happy to help you choose the best option for your unique environment and the planter that adds the perfect finished look. Tired of Replacing Expensive Trees? Go Faux! Landscaping upkeep can be difficult and expensive. Live plants are also susceptible to disease, rotting, and natural elements, making their maintenance irregular. Take away the guesswork and unpredictability without losing the style or natural elements. All it takes are outdoor artificial trees. Maple trees are a classic variety and make excellent faux leaves. The variety of textures and shades of green make the foliage look as lifelike as possible. Maples thrive in a variety of climates, so a fake version will most likely blend in with the surroundings and look good year round, no pruning required. This 6' Japanese Maple can be placed in any style of planter for a look that is polished and lush no matter the conditions. Many people love the look of palm trees but live in areas where growing a palm just isn't practical or realistic. Silk palms are made of polyblend material that holds color and withstands UV rays to keep the tree in top condition for years. This 6' Sago palm features 18 life-like fronds for a full and rich look. Outdoor artificial palms can create a tropical oasis no matter where you live. Olive trees are a classic option that can give any yard a taste of Mediterranean flare. Because they don't grow very wide, they are a great option for smaller spaces. 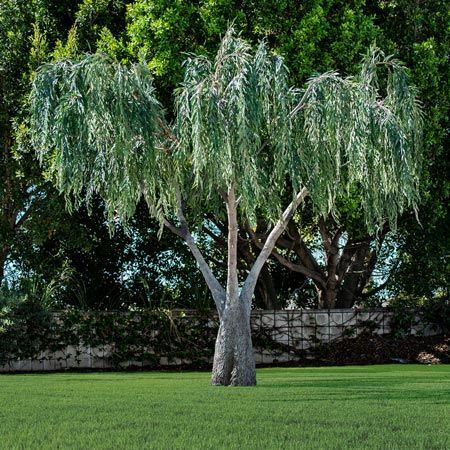 This 60" artificial olive has a natural trunk to give it a realistic appearance. The leaves are made of a material that fortifies the material against the elements and helps maintain its color and shape year round. The base is weighted to keep it upright at all times. This style works well in decorative containers - pick one that matches your style to create a unique and customized look! If you can't find an option to meet your needs, try going custom. We can provide custom specifications to whatever your imagination desires. Creators can replicate an existing tree or create something entirely new. Don't be constrained by nature - go ahead and create a whimsical tree that could never happen in the real world. The possibilities are truly endless, but each option will be high quality and create a garden oasis anywhere.